Revenue is declining, and the shoe retailer is shifting its strategy in hopes of getting back on a profitable growth track. 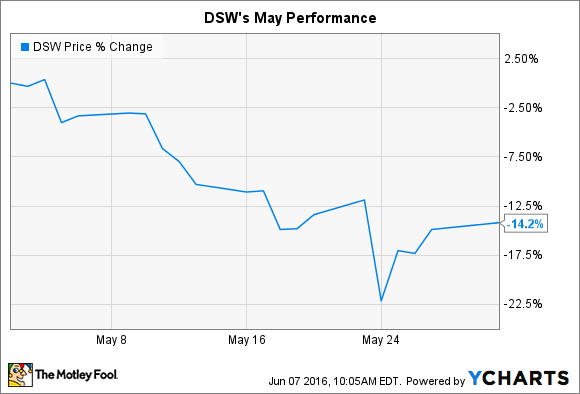 What: Shoe retailer DSW Inc.'s (NYSE:DBI) stock fell 14% in May, according to data provided by S&P Global Market Intelligence. The slump contributed to a 42% decline for shareholders over the last year, compared to a 1% uptick in the broader market. So what: Investors punished the stock last month in response to a surprisingly weak first-quarter report that included falling revenue and worsening profitability. DSW's comparable-store sales declined by 2% as customer traffic sank. The retailer was also forced to cut prices to keep inventory moving through the system. Gross profit margin dropped to 44% of sales from 46% a year ago. Management has determined that the situation is bad enough that it warrants a shift in DSW's broader strategy of spending to achieve revenue growth. "Over the past three years, we have invested heavily in technology, stores, marketing and support services," CEO Roger Rawlins explained in a press release. "These investments have driven sales, but we haven't grown our bottom line," Rawlins concluded. Now what: In response, executives plan to embark on a cost-cutting initiative that will likely include slower store expansion. DSW is also conducting a strategic review that should help "improve earnings and reinforce our competitive position in a rapidly changing environment," according to Rawlins. Whatever changes management makes will take time to pay off. Until then, the company believes customer traffic levels aren't likely to recover. In fact, DSW lowered its full-year sales and profit outlook and now expects to book a slight revenue decline on a comps basis while gross margin continues to tick lower. It hasn't abandoned growth targets like boosting its e-commerce business. However, priority No. 1 remains finding a way to return to steady comps growth in an environment where shoppers are becoming more cautious in their apparel spending.